Theremin World - Steam Powered Theremin in the Wild West? Well maybe not exactly a steam theremin (at least not yet) but performance artist, and Art Institute of California faculty member, Lorin Edwin Parker did build a steam powered synthesizer, The Parker Steam Synthesizer. As part of his UFO installation with artist Jay Stuckey, he built ten different custom theremins. 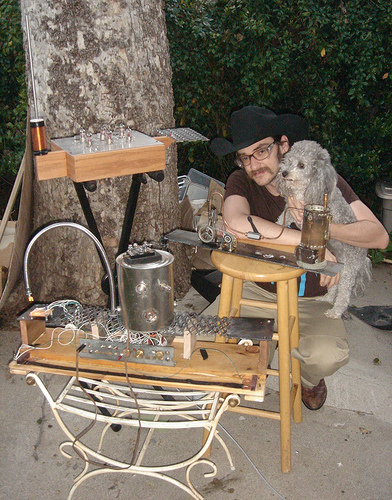 And for his latest Electric Western project, he built an all retro-tech tube theremin recreating as closely as possible Lev Termen's 1919 original. Keeping a Do-It-Yourself approach to all his work, his projects have included a wide variety of unique apparatuses. Parker also teaches DIY Workshops and tutorials. He's been featured in the Wired Blog By Alexis Madrigal. It's incredible how Parker pushes the envelope, even into the past, he's helping keep Lev's creative influence alive today.